Fish Pie - the very words conjure up cosy evening meals. 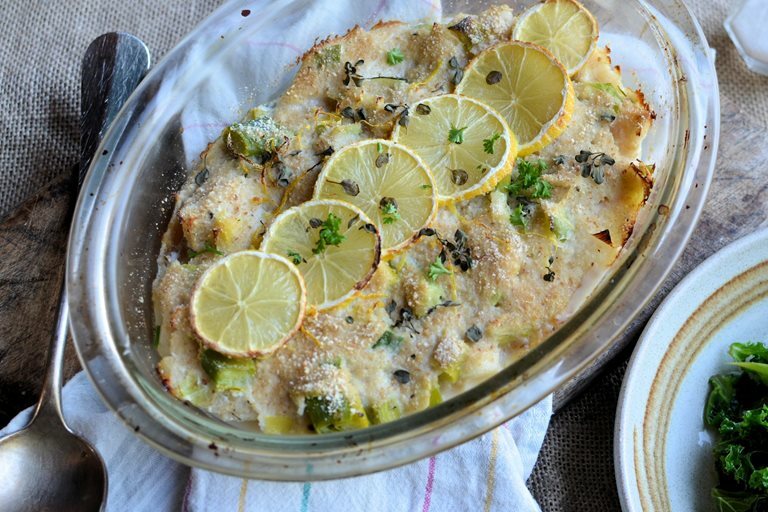 Karen shares how you can still enjoy all the comfort of a fish pie but with fewer calories than normal. This pie comes in at only 250 calories a serving when served with fresh kale. But, pies are laden with calories by default, they are the ultimate comfort food, packed with tasty, creamy fillings and encased (or topped) with pastry or potatoes. Perfect though they may be for a cold winter’s day, they are just a teensy-weensy on the high calorie side, unfortunately for me! The usual fish pie of my childhood, and the recipe that I still follow today (my mum’s recipe) comprises smoked haddock, cod, prawns, boiled eggs and peas all bound in a rich parsley sauce and topped with mounds, and I mean mounds, of cheesy mashed potatoes, with an extra layer of grated cheese and sliced tomatoes on top. A veritable hunk of a dish, and a firm family favourite. 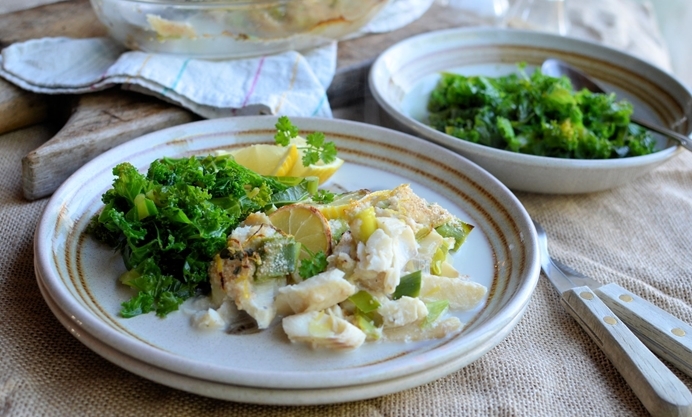 Whilst my Low calorie fish and leek pie may not have ALL of those elements in it, it IS comforting and also very filling; plus it has lovely Scottish smoked haddock and cod as part of the ingredients. This fish pie, when served with a generous portion of curly kale, is only 250 calories per serving, and it’s packed with flavour. It’s very easy to make, and can be on the table from start to finish in about 45 minutes. As well as the prime Scottish fish that I used in this recipe, there is a leek, some breadcrumbs with lemon zest and lots of fresh herbs. The topping is then finished off with some lemon slices, which make the pie look attractive whilst adding to the citrus flavour as the fish pie bakes. When cooking for a crowd, you can serve some mashed potatoes as an accompaniment, as well as assorted seasonal veggies.